You can be positive--no matter who tries to bring you down.Unfortunately, the world is full of screwed-up people. But the good news, says Elizabeth B. Brown, is that your world no longer has to revolve around them. With brilliant insights and a keen sense of humor, this trusted author shows you how to: take back the power from the difficult people in your life respond productively when confronted remain poised and in control when everyone around you loses it win fairly in unfair battles let go of the past and live triumphantly now Dozens of real-life success stories, brief diagnostic tests, and practical tools are included to help you assess your own unique situation and gain the confidence to live successfully with screwed-up people.You can stop being the victim of others and start loving life in spite of them. Dozens of real-life success stories, brief diagnostic tests, and practical tools are included to help readers assess their own situations and gain confidence to change self-defeating behaviors. This popular word-of-mouth bestseller now has an updated look. 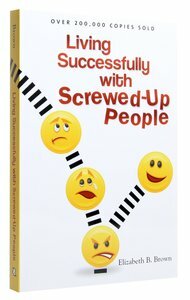 About "Living Successfully With Screwed-Up People"
Elizabeth B. Brown, author of Sunrise Tomorrow: Coping with a Child's Death and The Joy Choice, leads seminars across the country with her husband, a physician.